Today is being observed as the 12th anniversary of National Tree Planting Day, a special initiative of the Forestry Department. This year, the agency is focusing on the role of trees in mitigating the negative effects of climate change under the theme: “Adapting to Climate Change… Secure our future, plant a tree today.” The annual observance is usually the first Friday in October. 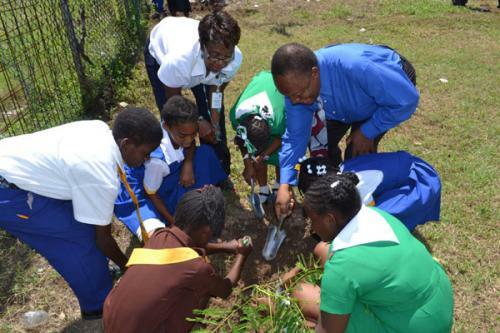 “We are ensuring that it is easy for everyone to participate because we are giving away tree seedlings to interested organisations, groups and persons to ensure that everyone has some trees to plant this tree planting day,” said Marilyn Headley, CEO and Conservator of Forests. If you are interested but unable to pick up your seedlings today, the Forestry Department’s nurseries will also be distributing plants next week.